Welcome to the first book of 2013! I had to pick this book as the first. I just read it and listened to the audiobook version and it was FANTASTIC! 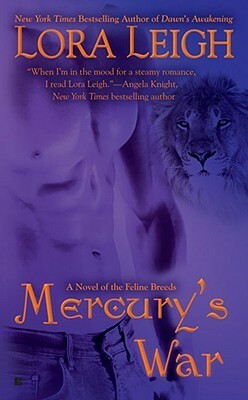 This week's book is Mercury's War by Lora Leigh, part of her Breeds series. Mercury is more Breed than most. He is one of the few Breeds who has been designed to be very close to his animal, the lion. But thanks to being drugged by scientists while he was being trained he has lost the connection to his cat to the point he thinks it is dead. His lion half isn't dead but is in hiding to ensure he doesn't get caged again within Mercury's psyche. Ria is the little orphan girl the original Breed family helped raise and gave a job to. Dane, the son of the head Breed man called The Leo has convinced Ria to infiltrate a Breed compound called "The Sanctuary" under the guise of auditing their accounts. In truth she is really searching for a traitor selling Breed mating heat secrets to drug manufacturers. Ever since the Breeds earned their freedom from their scientist creators and came out to the world protestors have plagued their homes and families, so Mercury is assigned as bodyguard to Ria during her time at the Sanctuary. Mercury is having trouble resisting the little pencil pusher and his cat is waking up. But when Ria's investigations lead them to more than one enemy within his cat will come roaring to life to protect his mate. But with his cat's return another member will seek to elliminate him before they can bring down the conspiracy that could destroy the Breeds. This book is awesome. Lora Leigh really knows how to weave a tale. Her Breeds books are filled with danger, espionage and so much passion your toes will curl. To see all her books check out her website. And see you all next week with the next book.